World number two Rory McIlroy was battling to remain in contention for a historic victory in the Masters during a rollercoaster third round at Augusta National. McIlroy was determined to erase the memory of a costly stroke of bad luck on day two, when his approach to the 18th clattered into the pin and rebounded 20 yards off the green. The four-time major winner, who needs to win a green jacket to become the sixth player to complete a career grand slam, hit a superb pitch to three feet but missed the par putt to leave himself five shots off the lead. However, McIlroy wasted no time in getting that shot back when play resumed on Saturday in far calmer and warmer conditions that had prevailed on the first two days. A par on the opening hole was his first of the week, albeit slightly disappointing after a drive of 348 yards was followed by a mediocre approach, but the 27-year-old then reached the par-five second in two and recorded a straightforward birdie. McIlroy then drove just short of the green on the short par-four third and chipped to two feet for another birdie, before leaving his hat-trick attempt short from 18 feet on the next. The Northern Irishman's charge came to a halt with a three-putt bogey on the fifth and a double bogey on the seventh, where his drive took an unlucky bounce into the trees. More bad fortune was to follow when McIlroy's approach plugged in a greenside bunker and after splashing out to 60 feet, he three-putted to drop back to two over. A birdie on the eighth repaired some of the damage and after a good chance went begging on the 11th, McIlroy holed from 20 feet to pick up another shot on the 12th. 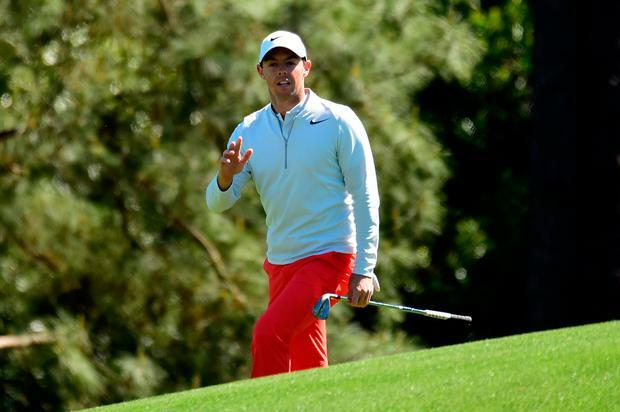 McIlroy cut the corner on the par-five 13th but proceeded to miss the green with his approach and had to settle for a par to remain level par, five behind joint leaders Sergio Garcia and Charley Hoffman. Garcia, who has recorded 22 top-10 finishes in majors without success, has the added incentive of being able to claim a first title on Sunday, which would have been the 60th birthday of two-time champion and fellow Spaniard Seve Ballesteros. However, the 37-year-old needed a vast improvement on his third round scoring average of 74.92, which includes an 81 last year and no scores in the 60s. A birdie on the fifth was cancelled out by a bogey on the seventh, but Garcia then hit the green in two on the par-five eighth and two-putted for birdie. Hoffman, who was ninth at Augusta in 2015 after lying second at halfway, had birdied the second and fourth before dropping a shot on the sixth. Rickie Fowler was a shot off the lead after covering the front nine in 36, with 2015 champion Jordan Spieth, Thomas Pieters and Jon Rahm a shot further back. Spieth was continuing a remarkable fightback after carding a quadruple-bogey nine on the 15th on Thursday, the 23-year-old carding birdies on the sixth, eighth and ninth to be out in 33.